#Microsoft365 #Office365 Of course I’m referring to #Technology, #UserAdoption and #Training. And when I say ‘bad’ habits, I don’t mean what we did before was wrong, it was right at that time, but times has changed and so has technology. Which means we have to change as well. The misconception that ‘new shiny apps and services’ fixes your broken processes and culture will cost you dearly. I love AI, robotics and all the cool geeky stuff that comes with it, but I love people more – we need to invest in upgrading them so that we can walk this path together. Think of it this way, for someone who’s never driven on either the left or right side of the road it will be easier to start driving either side. For someone like me who’s driven on the left side of the road all my life, it’s pure chaos trying to drive on the other side of the road when travelling overseas. Does that make me a bad driver? Am I more resistant to change? Or am I just being a difficult “user”? Really…..? You just said that to me? So let’s talk about Intuitive Design., and your 2 year old. I take it she’s worked on MS-DOS, XP, Windows Vista, Windows 7, 8 and 10 before. She’s used Office 2003, 2007, 2010, 2013 and now 2016. She’s seen the technology she’s used to change from black and white, to colour, from drop-down menus, to ribbons and now back to drop-down menus. Nope. Any person who doesn’t have ‘muscle memory’ with older, different systems adapts to new technology faster. 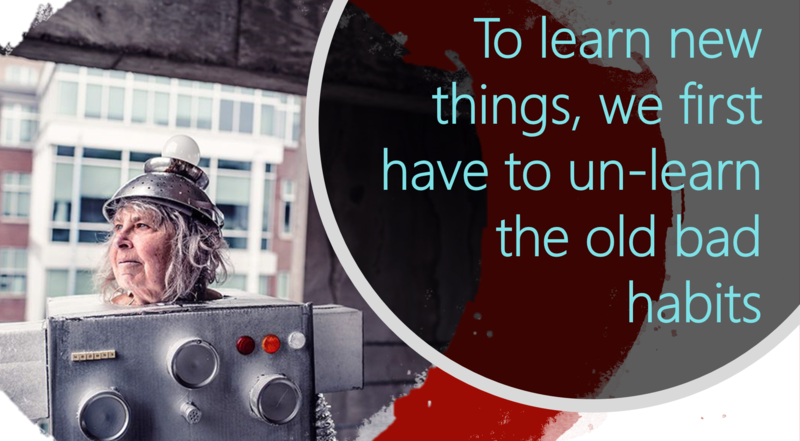 That’s pretty much why the kids are kicking our asses, they don’t have so much ‘muscle memory’ to unlearn. Don’t feel bad, we were those kids once. Training someone new technology who’s had a lot of experience with other (older) technology needs more effort. And you know what, that’s ok. Because that person also comes with a lot of business experience and wisdom. Understand the pros and cons people. Stop making millennials into these “IT wizards”, I’m sure they’re sick of that too. Believe me, if the smartphone world had to change from touch screens back to buttons and navigating, us old folk would be winning at life. Cause we have muscle memory to deal with that. So when “experienced” people learn new skills, they have to work a bit harder at repetition and using those skills so it sticks. 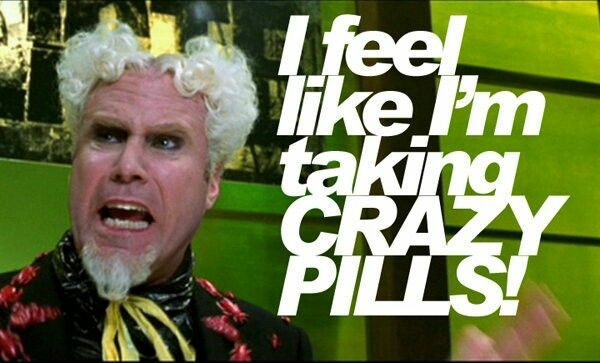 Sending someone a pretty email with a link in it to the Office 365 Training Center is not gonna do it. 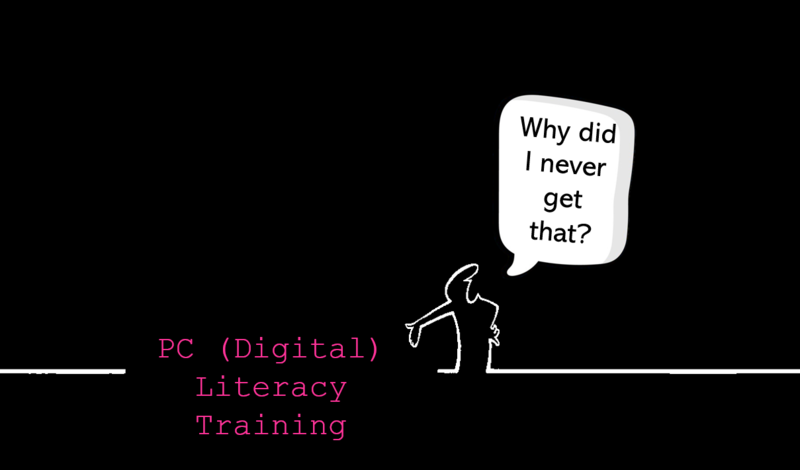 PC literacy, or digital literacy as we know it these days have a much bigger impact on your user adoption than you’ll ever know. I swear, it feels like I’m one of those “The Zombie Apocalypse is Coming” people with the posters, and no one is listening. We’re focusing on the wrong stuff. You can’t expect people to learn all these new cool, life changing technologies if they’re still struggling to be productive on their own laptops. It’s difficult to say what the measurement is for PC Literacy. I can promise you that 70% or more of your users aren’t what is considered PC Literate. If you don’t agree, I urge you to read this blog of mine that gives the statistics to prove it. Basic PC training should be included in Induction, then you’ll have less of those ‘stupid calls’ being logged with help-desk. People are not productive, but they don’t even know it, which makes it a silent killer if you ask me. To prove my point, here’s a short video about search skills. This could save your company at least 5 minutes a day per user – go work out how much money that is in the form of salaries and then tell me training is not worth it. Here’s some other resources related to this topic. I hope I’ve managed to make you think different about User Adoption and Training. It’s time to start investing in your greatest assets – your employees. Bravo! Thanks so much for your posts. They have been a huge help to me! You are so welcome. If I can change and help one person a day then my life and efforts will be worth it! !